This Situation Update describes events occurring in Bu Tho Township, Hpapun District during the period between March and May 2013, including forced labour, land confiscation, civilian conditions and armed actor activities. Area monk U Thuzana ordered forced labour for bridge construction in P--- village, Htee Th’Daw Hta village tract, Bu Tho Township. Burma government officials confiscated land for a bean plantation project. Tatmadaw continued to transport rations and repair an army camp despite the ceasefire talks. Fighting broke out in K--- village after Tatmadaw BGF soldiers allegedly trespassed into KNLA territory, resulting in the injury of a father and son caught in the crossfire. The following Situation Update was received by KHRG in July 2013. It was written by a community member in Hpapun District who has been trained by KHRG to monitor human rights conditions. It is presented below translated exactly as originally written, save for minor edits for clarity and security. This report was received along with other information from Hpapun District, including 25 incident reports, 25 interviews, 226 photographs and 47 video clips. In Bu Tho Township, from the beginning of March to May 2013, during that three-month period, I documented the Tatmadaw’s activities and situations, as well as the civilians’ situations, including demands, forced labour, forced recruitment and the abuse of human rights in many ways, as well as the condition of villagers’ livelihood, health and education. In Bu Tho Township, Htee Th’Daw Hta village tract, P--- village in Lwa Hsay area, there is construction of a bridge that crosses Pgheh Loh Kloh [River] from east to west, and they project that it will take three years to complete. In order to construct the bridge freely [without being bothered by non-BGF [non-Tatmadaw Border Guard Force] related armed groups, they named the bridge ‘monk U Thuzana Bridge’. They asked the civilians to go and help [work for] them and said that it is a donation or volunteer work [making merit] for religion. So, the villagers in the village have to go and help in shifts. In actuality, this plan is not related to the monk, but to the company. All the plans are processed according to the armed group’s [BGF] orders, as the order letters for work are from the armed group. In Bu Tho Township, during three months, from the beginning of March to May in 2013, when we arrived at the township, we did not know of any killing that occurred and it has likely decreased. Regarding the health care problem, there are differences between each place. 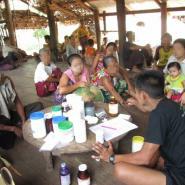 In the area that is out the Tatmadaw’s control, whenever they are sick, they would depend on the KNU [Karen National Union], the mother organization’s plan [treatment], and do not need to pay money [for medical treatment]. For the people who live far away from the clinic, most of them use thay day wah day. Some patients recovered from their sickness, and some people died anyway. But if we compare among those people who died and survived, the percentage of people who recovered and survived is more than those who did not recover and died. 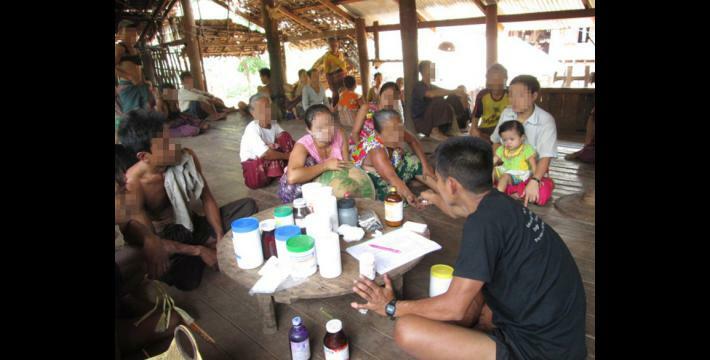 People who got treatment from the mother organization, KNU, likely means that [this treatment originally came] from FBR [Free Burma Rangers] or Back Pack [Health Worker Team], and was distributed by KNU members. For the people who live under the control of the Tatmadaw, whenever they are sick, they would go to the Government clinic and they would have to pay their expenses. They have to pay money that is worth the amount of medicine that they get. If you get lots of medicine, you will have to pay lots of money. It also depends on the sickness or disease that they have. 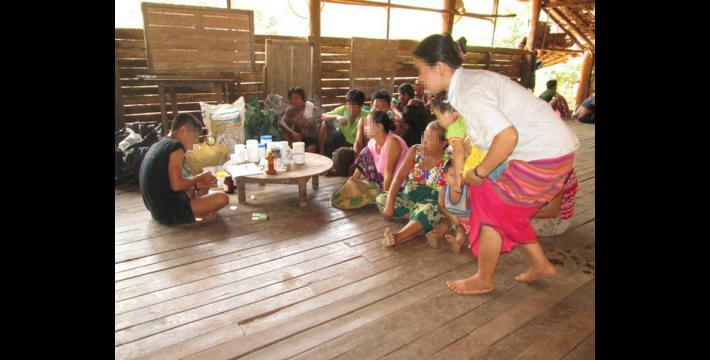 There are some villages that have a Burma government clinic. They [Government officials] claimed that the clinic is for the civilians, but there is not enough medicine, and the medics do not work on their duty regularly. The medics are not at the clinic when the villagers urgently need them. According to what the villager said, they will have to pay half of the expenses [of building the clinic] if the clinic is completely built. But they have not paid anything yet as the construction [of the clinic] is not finished. This location is Kyoh K’Loh village, which is in Htee Th’Daw Hta village tract region. In our township, land confiscation mostly occurs in the places close to the vehicle road. The Burma government mostly confiscated the lands such as flat field farms. From the beginning of May, the villagers were told [by the Government] to plant [round] bean. Currently, the villagers are ploughing their farmland to plant beans. Those who own farms close to the vehicle [road] could not plough in order to plant the paddy because they have to wait for the Government’s plan. No one knows how their plan will turn out. This is what the Burma Agriculture Department’s officers will show their leader when they come. They [villagers] do not know if they [Tatmadaw officers] will do that until it succeeds or not. If they do that until they succeed, the villagers do not know how many acres of their land will be destroyed, and this will create problems for the villagers. This mostly happened in the Hpapun area where IB [Tatmadaw Infantry Battalions] #434, 341, 340 and LIB [Light Infantry Battalion] #19 and IB #642’s army camps are located. Most of the farms belong to the villagers. They also have not yet returned the lands that had been confiscated in the past to the villagers. Another thing is the disagreement regarding the land among the civilians who work on the rubber plantations. People who have more money build large rubber plantations and people who have less money [have] very little land for cultivation, and they do not have land for grazing cows or buffalos. Moreover, bamboo and other trees have been cut down. The villagers do not know the advantages and disadvantages of rubber plantations. Because the price of rubber is high, many people plant rubber trees. So those who are weak [because they lacked money] face problems. Now, there are two kinds of civilians, [those] who are out of the area controlled by the Government and people who are under Government control. If we have to compare these two groups of people, people who are under control have more freedom to travel around, but for people who are out of the control area, they have more problems travelling around on the vehicle road or in the city. After the KNU met with Burma [for the ceasefire agreement], travelling around became easier for people who are out of the control area. Otherwise, the people who are in the out of the control area would not be able to travel or go around on the road or city. Most of the civilians here are flat field farmers or hill field farmers, and [work on] plantations. There are a few people doing business. Nowadays, the civilians lack opportunities and they hope for the country’s freedom. There is no economic ability for them [to do business]. Their plants from hill fields and flat fields were destroyed by the insects, and the plants turned yellow and died. They could not figure out a way to make it better. [They want to] try other ways, [and since] there is no freedom [to do pursue their livelihoods], they hope [leaders] plan for a better future. In this area, the Burma government and the KNU leaders had the ceasefire talk so there is no special activity of the Tatmadaw. If we have to compare the forced labour demands and movement restrictions that happened in this year and in the past, this year it has decreased a little. To compare previous years and now, there are differences. However, the Tatmadaw [continue to] transport its rations during the ceasefire period. In Bu Tho Township region, the Government and the KNU leaders had signed the ceasefire but their soldiers’ activities have not changed. Moreover, they [Tatmadaw] sent more weapons and repaired their military camps based on the border [Burma-Thailand] and repaired their fences everywhere. Now, Burma government soldiers are waiting and watching the situation, and they just let the BGF stay active. The two BGF battalions that are currently active are Battalions #1013 and #1014. 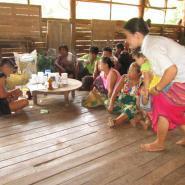 They are active in Htee Th’Daw Hta village tract, Kyaw Pha village tract and Day Wah village tract. The two active battalions are BGF #1013 [with] Battalion Commander Hla Kyaing, Battalion Deputy Commander Kyaw Win [and] Battalion #1014 [with] Battalion Commander Maung Hsee [Maung Chit] and Battalion Deputy Commander Tin Maung Soe. Battalion #1013 is based in Paw Htee Hkuh and Battalion #1014 is based in a new place close to Tha Aw Plee. The two battalions combined and built an army camp in Meh Seik, and they also use landmines for their security. On February 5th 2013, one of their landmines exploded and hit a Meh Hsee villager’s buffalo. Although the buffalo did not die, they shot the buffalo and ate it without paying the villager anything. The landmine that hit the villager’s buffalo was planted beside the fence of a sugar cane plantation, and they did not inform the sugar cane owner about it. At that time, the camp leader was Pah Tha Beh, Battalion #1014 platoon commander, and his battalion commander is Maung Hsee. On June 19th 3013, Burma government soldier BGF Battalion #1013 Battalion Deputy Commander Kyaw Win ordered his soldier Saw Kaw Htoo to go and demand thatch shingles from Paw Ta Kwee villagers without paying anything. On March 13rd 2013, Battalion #1014 [soldier] Pah Th’Beh and his four soldiers entered K--- village in the afternoon around at 2:00 pm. They did not follow their rules as they crossed over the limited area that they talked about with KNLA leaders [demarcating KNLA territory], so the KNLA soldiers attacked them and fighting happened. The fighting injured a father and son. 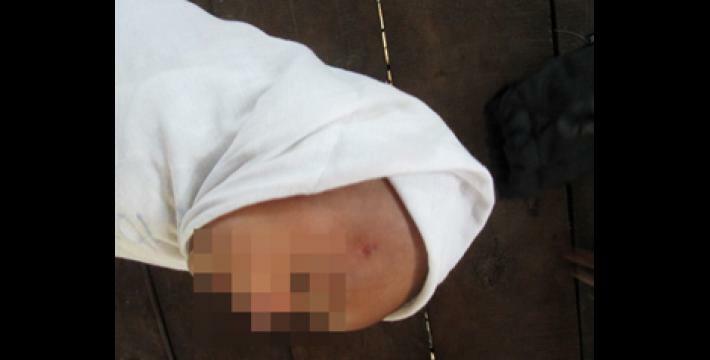 The father is named Kyaw S---, 40 years old, and his baby boy is just one month old. Kyaw S--- was hit on his right elbow and his child was hit at the right side of his head on his temple by M79 [grenade launcher] shrapnel. The villager did not know if the villagers were hit by a KNLA or BGF weapon. The Burma government ordered its BGF army to secure Meh Hsee [village] where they have a plan for the dam in Taw Kyah. They want to construct it without being disturbed. Therefore, they ordered the BGF to take the security in advance. There are things that likely will be damaged if the dam is built. These are the activities of the Tamadaw that we have documented so far. Forced labour has decreased compared to last year, but they still do not pay money to the villagers if they make orders. In Bu Tho Township, regarding KNLA soldiers, wherever they go, they take courage [rely on resources] from the civilians. So, they inform the villagers before doing anything. Wherever they are, they encourage the civilians as best as they could. They also let the civilians express that any one [KNLA soldier] who violates any of the villagers’ rights has the opportunity to express or report it to the media groups. They also raised awareness about the fact that KNLA [soldiers] have no salary. They also said that we [KNLA] cannot afford to buy things like Burmese [Tatmadaw] soldiers or the BGF, so we just rely on civilian support. They also said that they have to respect the civilians’ rights. Civilians in Bu Tho Township mostly earn their livelihood by farming, cultivation and rubber plantations. At that work place [within Bu Tho Township], there is no way for them to do other business. Because the civilians do not understand the rules of business, if [an outside] business came into their work place, there would be problems for them. Now, they have been farming and cultivating for a long time ago, and compared with previous years there were many differences. In previous years, the farm that they worked on provided 200 or 300 baskets of paddy, but now it’s decreasing. They get only over 100 or at most only 200 baskets. Livelihood problems are caused by many things. One of them is the Tatmadaw disturbance, and the other is because of the unstable weather conditions and rats and insects that destroy the paddies. Currently, the problems in the region, especially in the southern village tracts such as Wah Day, Kyaw Pah, Meh P’Ree and Htee Tha Daw Hta region, [are that] they planted a lot of rubber so the areas for cultivation are narrowing, so has it caused livelihood problems [since there is less planting area]. The people who planted the rubber are not the people from companies but rich civilians. They [rich people] knew that if they develop rubber plantations they would get so much money and would buy rice for their livelihood. Because of this, it has become a problem for poor people who don’t have money. Regarding this problem, the villagers don’t know how to figure out a way to solve it. The information that I have mentioned above is incidents that happened during the period when I was documenting human rights abuses. Some incidents I faced myself, and for some I heard it f from the villagers. The villagers still do not know what problems regarding food, health and education will come in the future, and they also do not know a way to solve it. 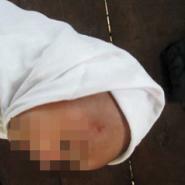 Earlier information on this incident was published as “BGF and KNLA grenades injure villagers and their children in Papun,” KHRG, July 2013. The Democratic Karen Benevolent Army (DKBA), formerly the Democratic Karen Buddhist Army, was formed in December 1994, led by monk U Thuzana with the help and support of the State Law and Order Restoration Council (SLORC), the name of the military government in Burma at that time. The DKBA was originally a breakaway group from the KNU/KNLA that signed a ceasefire agreement with the Burma government and directly cooperated at times with Tatmadaw forces. The DKBA now refers to a splinter group from those DKBA forces reformed as Tatmadaw Border Guard Forces, also remaining independent of the KNLA. As of April 2012, the DKBA changed its name from "Buddhist" to "Benevolent" to reflect its secularity. Thay day wah day is a Karen term referring to traditional or herbal medicine.